Richmond educator Danielle Greene says “teachers have the opportunity to use their talents and gifts to make the world a better place for all of us.” Greene recently spoke at the Fall Convocation for VCU’s School of Education. Before she departed for Stanford University where she’s pursuing a doctorate, 88.9 WCVE’s Catherine Komp caught up with her for this edition of Learning Curve. Danielle Greene will always remember Miss Finley, her first and second grade teacher. Danielle Greene: She just kind of really pushed me out of my shell and in a lot of different ways academically, personally. I remember she had this saying and it was huge on her blackboard and I had her for two years so it's ingrained in the back of my mind and it said “I can.” And that was something that I definitely carried with me for a really long time. 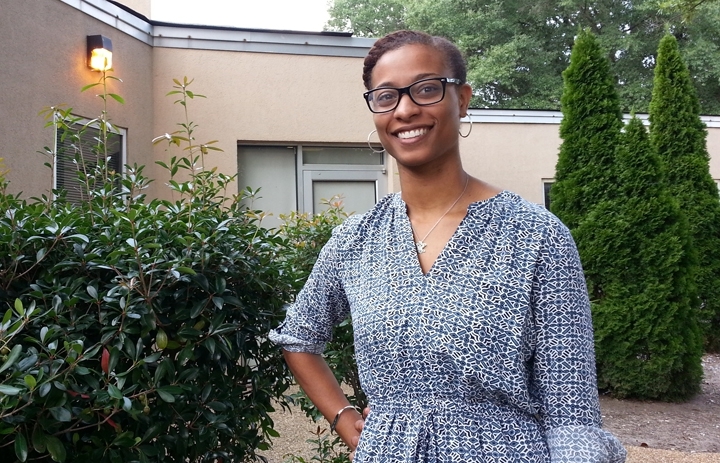 Danielle Greene spent the last five years in Richmond Public Schools. She was in the second cohort of the Richmond Teacher Residency program and she taught social studies at Boushall Middle School. In late August, she was a featured speaker at the convocation for VCU’s School of Education. Greene (speech): I am so happy to be speaking to a room that will cultivate and groom our future into the best and the brightest. Whether your path is headed towards policy, administration, counseling, research or teaching -- be conscious of the fact that you have the ability to mold, to build or to break down human beings. Whether you intend to work with children, adult learners, or persons with disabilities, which I will point out is not mutually exclusive from the first two, you have come to a university or you are at a university that is emboldening you and will place you in a position to make this world a better place for someone else. Greene says educators shoulder a lot. In addition to teaching, they’re expected to be nurses, counselors, first line psychologists and therapists. Greene: There are very few professions that are asked to be so many of those things all at once. And in that we can become overwhelmed. When your own frustrations seep through then sometimes it can be a very frustrating place and you can end up taking that out on students. And so that's something that I just wanted people to think about is we have all of these different roles. But at the end of the day students are students, and so we can’t take our frustrations out on them. Greene says recognizing and responding to implicit bias is also a critical part of building stronger classrooms. Greene: I am a believer that everyone has bias every one of some ways shape or form. We all have it and it can be either things that we were brought up with; they can be societal, messages that society has kind of infused into us; or just assumptions that we've made on our own. And the important part about that is to make sure that we don't allow our implicit biases to negatively impact the children that we work with or the people because some people are adult educators and that's why I often try to steer towards using human beings instead of children. But I don't think enough teachers are aware of their own implicit biases and that's why I said what I said because nobody wants to be biased. Nobody wants to be prejudice. Nobody wants to be any of those things that have negative connotations. But the only way that we can fight through those biases and to fight through those types of things is by acknowledging that we have them in the first place and acknowledging that we do have the power as someone's instructional leader to put them on a path for worse things. I had a math teacher that I just really did not do well with and it really colored my opinion of math, but not just math but my own abilities with math. I believe that process happened because she had owned her own implicit biases that came out that I received as a child. We have the power to make or break other people in ways that I'm not sure other professions necessarily always have and that's because people look to us to be the good in their lives. When you look at teachers or maybe nurses or a lot of different service fields people are looking to us to build them up and when we tear them down it hurts so much more than I think when someone else does it. As educators we need to always be conscious of the fact that just as much as you might be building one child up you might be tearing another one down with the same statement or the same activity or offhand comment. And we need to be especially conscious of the way that we navigate those spaces because so many children depend on us, so many adults depend on us. And to not acknowledge our implicit bias, to not acknowledge that we are not perfect, that we get frustrated, that we sometimes say things in an offhanded way that might come across incorrectly to someone else, is to put the people that we work with at a disadvantage. Greene (speech): Regardless of the age level or the ability of your students, we are meant to perceive them as we would want to be perceived: as people with feelings, families, faiths and fears. If at any point, you feel as though you are incapable of working for the betterment of all people, embracing their races, ability level, native languages, economic statuses, religion or sexualities, education is not the place for you. I know this is contrary to what you expect to hear before a new term begins, but it must be said and it must be said early. Komp: How did you practice this in the classroom? How did seeing your students as people with feelings and families and fears come through in your teaching? Greene: I have the great privilege of teaching social studies (laughs). And I say privilege because I can navigate my students humanity in a different way than teachers of other subjects can and that's not to say that other subjects cannot but I deal with humans in my subject matter. Even teaching civics or government or economics, they're all connected into how humans have built, like how a bill becomes a law or things like that. And so we have a lot of discussions, debates about humanity and humanness and I've taught you know U.S. history from 1865, so post-Civil War to the present, which is a really exciting subject. And so when we are talking about different things in class, history related things in class, their opinions come through strong. It can be just as a subjective subject as it is objective. And listening to them and listening to their stories and listening to how their brain wraps around certain concepts like democracy or limited government, I get to see a lot of their personal personality and so that makes them incredibly human for me. Because when we talk about things like the Westboro Baptist Church and hate speech versus free speech and they start talking about how they perceive things, faith comes into that, if they prescribe to a certain faith or if they don't or if they don't have faith of any kind, that's something that we talk about in class. And there are so many different things we talk about inside of the classroom in terms of how society works that allows me to really see their own humanity. And I really feel privileged to have them in the eighth grade because they're old enough to defend their thoughts and their feelings and explain why. But at the same time they are still looking for guidance in a lot of different ways. And so they want to know that it's ok to have the thoughts that they have and regardless of if I disagree with them or not, my job is to validate them and teach them how to think, not what to think. Subject matter aside, I have the best of relationships with my students. I hugged them before they come into the classroom. I make sure I know all of their names before the second week of school, that's my first weekend putting faces to names. Making sure that I understand why homework is not done sometimes, because it's not just because a child doesn't want to. Sometimes I don't get my lesson plans done on time, not because my lesson plans aren't of a priority to me but because I have other things to do or things that are kind of more concerning. And I think that every day with my students I make sure that when they walk in the door, I try to see them as a human. And my goal often in my social studies classroom is to get them to see their classmates as humans. Greene says it’s important to be there for students after traumatic events, like police shootings and the recent neo-Nazi rallies. She says while complex and difficult, these issues can’t be ignored. Greene: I remember some of the most miserable experiences that I had and I'm thinking of college when catastrophic events happened and teachers came in and were-- you know the day moved on and there was no acknowledgement that some of the people in the classroom collectively were struggling, were not concentrating, were uncomfortable. Because instead of having that conversation that would have kind of eased tensions in the classroom, they did what was comfortable for them and they ignored it. As an instructor I don't think that we can do that. I see the understanding for it maybe in a college space. I'm not an advocate of that in any space honestly but in K-12 education I think that's something that needs to be discussed and so on days after the election, Baltimore, Ferguson, I wiped my day clean and I just pushed back my schedule. So for Charlottesville, to show you what it would look like in my classroom possibly, they'd come in the room, the date would be on the board, and the word Charlottesville would be on the board, or another word maybe white supremacy or neo-Naziism, Naziism period. And usually what I do is I have them come in and take out a sheet of paper. There's one word on the board and I want them to to free write. And that's how we start. The strategy Greene uses is “Think Pair Share.” After a brief free-write, students have the option to pair up and share their thoughts or exchange their papers. Then she moves class into group discussion based on questions, facts they can look up or videos they can watch. Greene: And it just gives them a space to process. Are there tears? Yes. Are there arguments? Yes. I mean it's not like a happy go lucky space, these aren't happy go lucky issues. And that's ok because they need that space. Maybe they didn't learn what they needed to learn for my SOL that day. But maybe they'll go to the next class more able to focus because they've been able to get it out or come back the next day if I have them at the end of the class period. And I think that it builds their trust for me. They see that I know that they are affected by things outside of the classroom. And ultimately I think it makes them work harder for me on other days because they know that I see them and I see that there are things that are going on in life that affect them. It makes them better students. Komp: You've been with RPS for a number of years. Where do you see the most progress and what are your suggestions for some of the biggest challenges the district is facing right now? Greene: One of my favorite things that Richmond has done is create, I think it was under Dr. Bedden, the FACE department, Family and Community Engagement and it's been a department that's really attempted to focus on how do we bring families into our education space. How do we make sure that student's needs are met not just inside the classroom but also outside of the classroom, whether it be language barriers or socioeconomic status or transportation to certain things. I feel like that is an amazing step in the right direction to recognizing the whole child. They don't leave their problems at the door and so trying to develop a space where we focus on not only the students but on their families and on communities is phenomenal. For Richmond public schools where I think that they need to go to get to where they need to be the one thing that I want to say is they need to listen to their teachers a bit more than I feel like they have been doing in the past. There have been surveys and I did like that, they've been sending out surveys about your opinions on this or climate surveys. A lot of us however still don't feel heard and because we're on the frontlines of educating these students, it is very difficult to have some type of systemic change that does not involve teachers. And yes there are school boards and we can go to those but so many teachers have families and can't make it out to those things and that's not to create an excuse but to from top down start investing more in the voices of their teachers because we're the ones who work with the students. We’re the ones that see the needs that they have. We are the ones who are developing the lessons. We are the ones that have to make sure that the curriculum is taught. We're the ones that are responsible for those scores at the end of the day. So I think that not only by bringing in the family and community voices, there needs to be a concerted effort to bring the voices of teachers to the forefront. And until they do so, I don't see it developing into the district that we all know that it can be. Danielle Greene comes from a long line of educators. Her grandmother was an elementary school teacher in Richmond for three decades. And her mother, Daisy Greene just retired after 31 years at Richmond Public Schools. Greene: My mom has always told me that at the end of the day you're there for the children. And there's so many politics wrapped up into schools and into education and whatever needs to be done for your kids is what you need to do. I find that to be incredibly solid advice because there are days where you can just get so wrapped up into the numbers, into what you need to turn in, into all these things that you can neglect what your kids need or why you are there in the first place. I think likewise my mom has always taught me that I needed to be what I've heard other people say and she's never used this word but I've heard other people use it, as being a “warm demander.” And I really have lived my educational career by that.You can you can demand things of your students and you should demand things of your students, have high expectations. But you need to be warm with them. You need to make sure that, and I use the word human a lot, but they see you as a human - apologize to your students when you're wrong. That's a huge piece of advice. I don't remember too many times when I was apologized to as a student or that I've heard other educators apologize to their students. I have but it's not as abundant as it needs to be, because they need to know that you make mistakes too. They need to know that if you make a mistake it's ok, this is a safe space to acknowledge that, because then they mimic you. My students mimic me in so many different ways as they get more comfortable with me and making sure that I'm warm in the way that I interact with them. But at the same time I demand that they do what is expected of them, has been some of like the best advice that that my mom has given me. Just be there for the kids at the end of the day, that's what you're there for, and make sure you warmly demand the highest of things from them. Danielle Greene is now at Stanford University, pursuing a PHD in Curriculum & Teacher Education. She wants to start her research by looking at cross-cultural teacher student relationships in urban education. Greene: In public schools in America, the vast majority of teachers are white women and that is no longer what our student populace looks like. The vast majority of our students are now of color and in urban areas, there's a high concentration of poverty. Statistically most of the teachers that are teaching are middle class. So you have a class difference and then there's race/cultural differences. And so I want to look at how we can bridge cultural divides between teacher and student in social studies classes to ensure that students are able to learn. It’s not just like a white black dichotomy either. The school that I taught in has a burgeoning Latino community. I am not Latino, I am black. And so when first navigating those spaces, there wasn't anything that I felt like had prepared me for that prior to. And so it was a difficult space to navigate. I feel like I mastered it it. I have great relationships with all of my students. But it took time and it was something that I felt like I should have learned or even discussed before I had stepped foot into the classroom. And so I'm going to take all of that, social studies classrooms, cross-cultural student teacher relationships, and then hone in on how we can put that into teacher education. I feel like a lot of our teachers are not being adequately prepared for those types of situations or settings in their classrooms. I don't feel like I was prepared for that. And that's to no fault of any one person, I think it's a systemic issue. And I think that I've watched a lot of teachers struggle with making those connections and not necessarily knowing where to go from, from what point. And a lot of great teachers seek out extra help or professional development or research things on their own. But it needs to be something that is discussed and taught before you ever step foot into a classroom. You have to have realistic expectations of what's going to happen in your room and how you're going to be able to to work with students because I'm a firm believer that students work best for teachers that they like. And you often hear people say “oh well they don't have to like me.” I disagree. I don't think that should be your main goal in the classroom is to have your students like you, but students are happiest and work hardest and learn the most from teachers that they like, that they respect, that they feel respect them and that they're most comfortable around. And there are a lot of bridges to cross when you have a teacher teaching a student that's unlike them. And you might go into a setting where the majority of the students are like you. But what about the two or three that are nothing like you. How do we bring them in? How do we use social studies to kind of bridge that gap? For new and veteran teachers, Greene also has some simple advice: one of the best qualities a teacher can have is patience. She says it comes in different forms, shapes and lengths but can allow teachers to go much further with their students than they imagined. For Learning Curve, I’m Catherine Komp, WCVE News.